Jewish settlement in Kenya began in the early 1900s. In August 1903, the British colonial secretary Joseph Chamberlain offered the Zionists a part of the territory in Kenya (the “Uganda Scheme”) for their own autonomous country at the Sixth Zionist Congress. The suggestion created much controversy among the international Jewish community, and was rejected at the Seventh Zionist Congress, in 1905. Although, this proposal was reverted, several Jewish families immigrated to Kenya. In 1904, the Nairobi Hebrew Congregation was established; by 1913, 20 Jewish families lived in Nairobi and the first synagogue was built. After the Holocaust, many more Jews immigrated to Kenya. By 1945, the Jewish community had grown to 150 families. In March 1947, the British set up a detention camp in Gilgil to hold captured members of the Irgun and Lehi, Jewish underground organizations, deported from Palestine. The Jewish community of Kenya worked very diligently in improving the living conditions of the detainees while stationed in Gilgil. 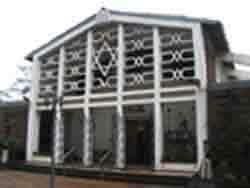 The new synagogue in Kenya was built in 1955. The community reached its peak in 1957 with 165 families. That same year Israel Somen, the president of the Board of Kenya Jewry, was elected mayor of Nairobi. Today, approximately 400 Jews live in Kenya; most reside in Nairobi. 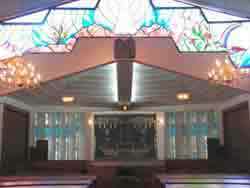 There are regular Shabbat and holiday services held in the only synagogue in the country. While the majority of the congregation is not Orthodox, the services follow Orthodox traditions, including separate seating for men and women. The community is led by Rabbi Chananya Rogalsky, an American who is an African envoy for Chabad-Lubavitch. All kosher food is imported. The community center, in the Vermont Memorial Hall, is located adjacent to the synagogue, and holds many weekly educational and social events. Kenya and Israel have enjoyed a strong and fruitful relationship based on mutual friendship, respect and trust. The roots of these friendly ties can be traced to pre-independent times when Kenya was struggling to attain sovereignty and, later, as a young nation coping with the challenges posed by self-governance. Even before Kenya became independent, Israeli experts from various fields were assisting Kenyan leaders to create and strengthen institutional bodies needed for statehood. The seeds for the creation of organizations such as the National Youth Service were planted, based on the Israeli “Gadna” experience of enlisting the country’s youth for national service, particularly in agriculture. The similar semi-arid climate, which exists both in Kenya and Israel, allowed this agriculture exchange of knowledge and experience to flourish. Long before Kenyan independence, Kenyans attended training courses in Israel. Following an official visit to Kenya by Golda Meir, Israel’s then Minister of Foreign Affairs, it was decided in a meeting between Meir and Kenyan Prime Minister, Mzee Jomo Kenyatta to place more emphasis on Kenya’s training needs in the fields of agriculture and medicine. The result was an extended effort to train Kenyans and bring Israeli know-how to Kenya by MASHAV. Under MASHAV, trainees from Kenya were flown to Israel for study, an effort that continued even after diplomatic ties between the two countries were severed following the 1973 Yom Kippur War. With the resumption of diplomatic ties in 1988, MASHAV diversified its efforts and Israeli experts arrived in Kenya to hold “on the spot” courses in various fields for large groups of trainees. A large-scale “school of irrigation,” was created in collaboration with USAID in the Kibwezi district, to bring the Israeli innovations in irrigation to Kenya. The result, following ten years of the intense training of hundreds of Kenyan farmers, was the complete transformation of the region surrounding the Project, into a self-sustaining, flourishing area. The Kenyan graduates of the Kibwezi Project, learned techniques that transformed them from farmers whose crops were barely sufficient to sustain their own families, into farmers whose efforts yielded enough to earn a decent living. In addition to the success of MASHAV in enhancing the strong bonds between Israel and Kenya, historical events have allowed the two countries to prove their friendship to one another. Such was the case when a group of terrorists hijacked an Air France flight to Entebbe, Uganda in 1976. The daring rescue undertaken by Israel’s special forces could never have taken place so far from home had Kenya not allowed the airplanes carrying the soldiers and the freed hostages to land and refuel in its territory. In 1998, Kenya was struck by terrorists, the target being the American Embassy in Nairobi. As the devastating effects of this horrific attack became clear, it was the Israeli Defense Force rescue teams who were the first international unit to arrive in Kenya. This experienced team, supported by heavy equipment supplied by private Israeli companies working in Kenya, worked day and night in an attempt to find survivors trapped under the rubble. Israelis and Kenyans working together to save lives marked the crossing of an important threshold in the relationship between the two countries. Following the 1998 attack, MASHAV, at the behest of the Government of Kenya, stepped up its training efforts in the field of medicine to cover issues such as “disaster management” and “emergency medicine.” The life-saving skills of hundreds of Kenyan doctors and nurses have subsequently improved as they have learned innovative techniques from Israel. In November 2002, terrorists struck again - the target this time, the Israeli-owned Paradise Hotel in Kikambala. Fifteen people were killed, three of them Israelis, when a car bomb exploded outside the lobby of the hotel as a local dance troop was welcoming vacationers from Israel. At approximately the same time, terrorists working with those who blew up the hotel fired two hand-held rockets at an Israeli airliner. This airliner had just lifted off from Moi International Airport in Mombassa with 264 passengers on board. Luckily, the missiles narrowly missed the plane and those on-board were spared. Immediately after the bombing, the Israeli government sent 200 soldiers and volunteers to Kenya to help with the search for survivors and clean up the debris. The attack on the Paradise Hotel was the first time that Kenyan and Israeli blood was spilt together. Kenya and Israel once again proved that the bonds between them were stronger than any terrorist plot and, as a result of the attack, strengthened their cooperative efforts in the field of security. Israel and Kenya came “full circle” when the re-opening of the Paradise Hotel was announced on the two-year anniversary of the attack on November 28, 2004. In August 2012, Israel and Germany teamed up with Kenya to sign a trilateral agreement for a project to upgrade the commercial fishery and wastewater purification systems in Lake Victoria, Africa's largest lake. As part of the agreements, members of MASHAV, Israel's Agency for International Development Cooperation, will help to revitalize the tilapia population in fish ponds around the edges of Lake Victoria and will then train local fishermen on how to maintain the levels while also working at the modern fisheries. Kenyan Prime Minister Raila Odinga presided over the signing ceremony. “We are trying to somehow better the yields of fish in a way so that first of all, the fisherman will get a better income,” Israeli Ambassador Daniel Carmon, the head of MASHAV, said. If the project proves successful, the Israeli team may carry out similar projects in Uganda and Tanzania, both of which also rely on the lake, and representatives have already started talks with Ugandans about the idea. Kenyan President Ukuru Kenyatta arrived in Israel on February 23, 2016, the first visit of a Kenyan President to Israel since 1994. Kenyatta is the son of the first Kenyan President Jomo Kenyatta, who solidified a positive relationship with Israel in 1976 when he allowed Israeli jets to refuel in Nairobi during Operation Entebbe in neighboring Uganda. While visiting Israel in February 2016, President Uhuru Kenyatta asked Israeli business-people and investors to invest in Kenya's infrastructure projects. Kenyatta stressed the need for investment in Kenyan transportation and renewable energy sectors such as electric, wind, geothermal, and solar, to reduce dependence on fossil fuels. A joint bilateral committee was established during the meetings to cooperate on water resources, and the agreement doubles the number of Kenyans who will undergo irrigation agriculture training in Israel. The Irrigation and Water Engineering Institute in Kenya was established during these meetings as well. President Kenyatta and Prime Minister Netanyahu signed agreements on irrigation technology and agricultural cooperation, and Israeli and Kenyan leaders also discussed increasing security cooperation to fight terrorism. A good portion of the meeting focused on discussions about how Israel can help Kenya deal with Al Shebaab militants, who have been responsible for several mass casualty terror attacks in Kenya. Following these meetings it was announced that Israeli Prime Minister Netanyahu will be visiting Kenya in July 2016. Photos courtesy of the Nairobi Hebrew Congregation.